We oppose the war against Iraq! The government says: Saddam Hussein is a vicious dictator. We say: yes he is. But he was just is vicious in the 1980s when we supported him generously in his war against Iran and even when he used poison gas against inhabitants of his own country. He was just as vicious in 1990 when President George W. Bush ended the Gulf War before deposing Saddam. He is only one of many vicious dictators that have been supported by U.S. funds and arms, including several repressive leaders now funded and armed more heavily by the U.S. War on Terrorism since Sept. 11, 2001. The government says: Saddam Hussein has weapons of mass destruction. We say: but Vice President Cheney also says that they are so well hidden that arms inspectors would not be able to find them. How then does our government know of these weapons? Scott Ritter, former Marine and UN weapons inspector in Iraq denies that the weapons of mass destruction exist. The government says: Saddam Hussein is a terrible threat to the United States. We say: 10 years ago, before the Gulf War, Iraq was a modern country. The Gulf War bombing destroyed water supplies, sewers, roads, schools and hospitals and left the Iraqi economy in a shambles. Ten years of embargo have worsened that situation. Saddam Hussein is less of a threat today. The government says: This is a war for peace and freedom. We say: Iraq has the world's second largest oil reserves ( after Saudi Arabia )in the Mid-East. 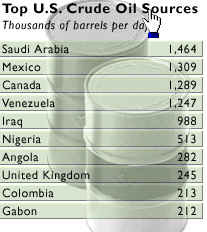 With those oil reserves under US control we would control oil prices and supplies. The government says: war against Iraq will be easily won. We say: the Gulf War is said to have cost 200,000 Iraqi lives. In the aftermath, more than half a million children under 5 have died due to contaminated water, lack of health care, and poor nutrition. While few U.S. servicemen and women died in the Gulf War, more than hundred thousand veterans of that war are said to be still suffering from a series of difficult to identify illnesses, known as "Gulf War Syndrome." The Gulf war was very costly to both sides; the next one will be even worse also for us. This war against Iraq will bring great suffering to the people of Iraq and may well cost many American lives. The government has no case to defend this military adventure. We say: no attack on Iraq!